Over the past few years NYC has been going through a sort of Texas style barbecue renaissance. With many new massive traditional smokehouses popping up, the competition is fierce and some will obviously succeed where others fail. While most of the places serving ‘cue are in the traditional format of counter, line, butcher paper, and meat by weight, Tres Carnes takes a completely different approach. 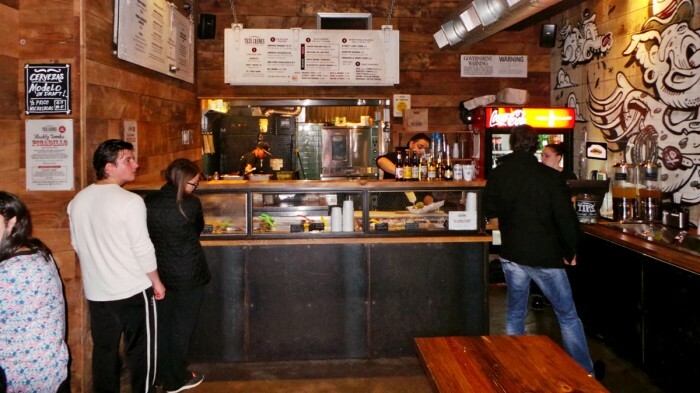 Their menu consists mostly of tacos, burritos, and burrito bowls which get loaded with authentic Texas smoked meats like brisket and pulled pork in a Chipotle-esque construction line. At Tres Carnes, the smoker is helmed by pitmaster Mike Rodriguez who has a pedigree that includes the very famous Salt Lick in Austin. This guy knows what he’s doing. 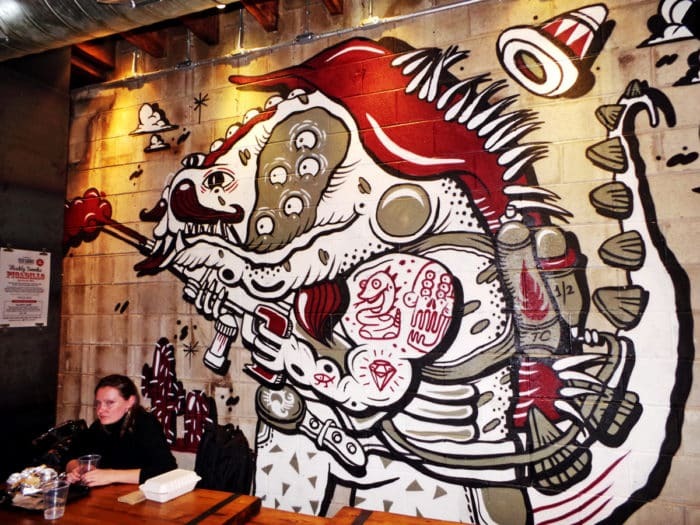 It’s a really cool looking place with an edgy yet rustic vibe that evokes the feel of a Texas smokehouse and urban skate-punk culture simultaneously. As soon as you enter the space you’ll be confronted by a deep smokey scent that fills the room encapsulating you like a warm, fluffy, down blanket. Breathe deep, drift away, you’re home. Like I said, it would be easy to compare Tres Carnes to Chipotle, but literally every aspect of Tres Carnes blows Chipotle out of the water. Everything from the carefully prepared, smoked meats to the flavorful, charred veggies to the herbal, well-seasoned rice and punchy salsas. Everything is made with love and you can tell. 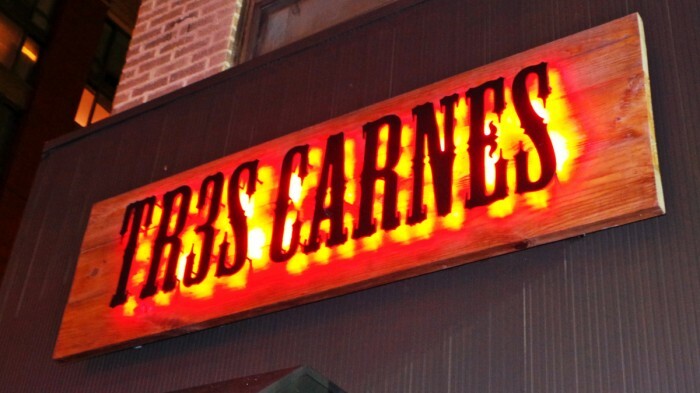 Now that I’ve visited Tres Carnes a handful of times, I’ve successfully refined my order to get the best bang for my buck. Often, I am eating here with my girlfriend and we have determined that splitting a single “El Tres” burrito bowl with double meat and all of the additional toppings between us makes for a more than substantial, extremely satisfying meal. I’ve tried a few of the other meat offerings, but at Tres Carnes, it’s all about the brisket. On this occasion, the meat was perfect, fresh out of the smoker with a nice crispy and peppery bark outside and tender meat with just the right amount of fattiness. The meat is killer, but don’t sleep on the additional toppings. 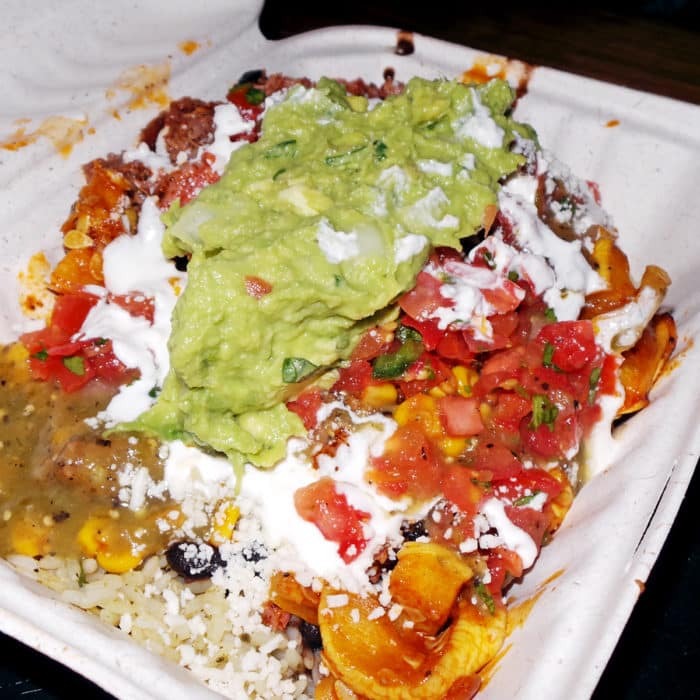 For only about a buck more you can get smokey street-cart corn, smashed smokey guac, and chipotle squash loaded on top. As delicious as the meat is, the chipotle squash is nearly as incredible. The texture is so perfect when paired with all of the other bowl fillings. 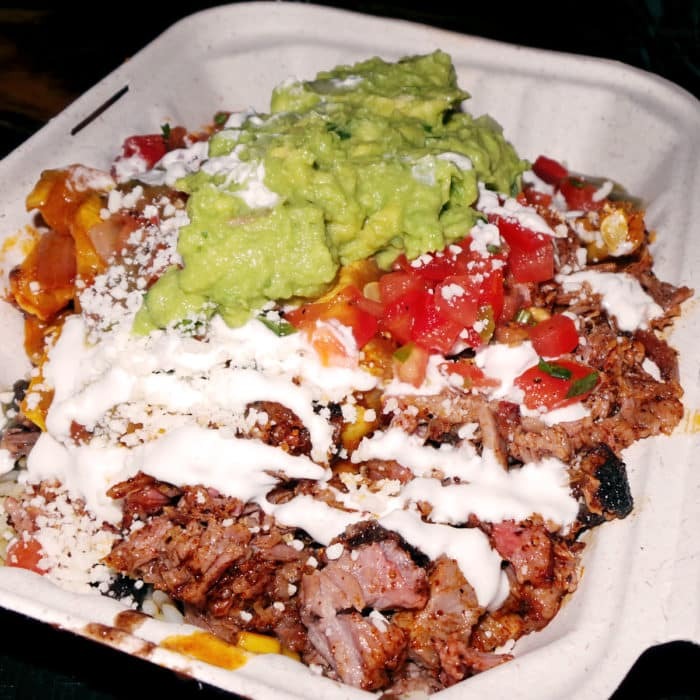 So take my advice, come with a friend and order an “El Tres” Bowl with Smoked Brisket Double Meat with green poblano rice, blackeyed-black beans, street-cart corn, chipotle squash, smashed & smoky guac, pico, tomatillo salsa, crema, pickled onions, and a sprinkle of cotija cheese. If you’re feeling crazy, pair it one of their delicious micheladas and enjoy the feast ahead of you. Just in case you’re not already sold, here’s the reverse angle for good measure! looks pretty delicious will have to add this to my burrito line-up! Oh yes, it’s really great. It’s really close to the office too so we’ll have to hit it up for lunch some time!